Screenshot taken from CBC News live feed. 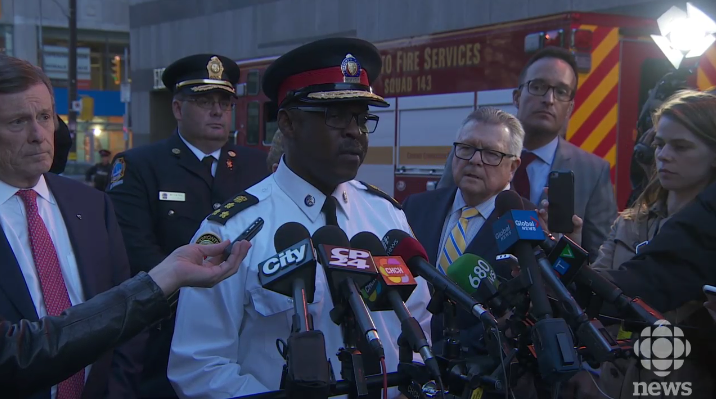 Toronto Police Chief Mark Saunders speaks to media following a fatal attack on Yonge Street in the city on April 23, 2018. Ten people have been killed and 15 more injured in a deliberate attack in Toronto Monday afternoon. At about 1:30 p.m. Eastern Time, a white rental van heading south on Yonge Street near Finch Avenue mounted the curb and ran down pedestrians. The vehicle continued the carnage for close to three kilometres until coming to a stop. A man got out of the vehicle and pointed what appeared to be a gun, calling on the officer to shoot him. The police officer on scene did not shoot the man, instead ordering him to get on the ground and placing the man under arrest. Police Chief Mark Saunders said the officer did a “fantastic job” finding a peaceful resolution at the end of the day. Saunders credited the training of his force with the outcome. He said nothing indicated the man had a gun. Police identified the suspect as Alex Minassian, 25, from Richmond Hill, Ont. Police have said after a thorough search, they determined Minassian was not in any police database. Officials have not commented on what may have provoked the attack. “This is a horrible day for the City of Toronto,” said Toronto Police Association president Mike McCormack when interviewed on scene by CP24. Other descriptions of the scene included descriptions such as “horrific” and “carnage.” Shoes and other articles of clothing were strewn across the street. Multiple bodies were seen covered by tarps. Tory called on the city to band together and support each other through this tragic time. “In times like these, we rely on our first responders to do the job they do for us. We are very well served and were from the first moment this became known to the authorities. They responded in a heroic fashion,” he said. Tory asked businesses in the area to close for the day and send people home. He called on people to avoid the area if possible as police continued their investigation. The area is expected to remain closed for several days. He expanded on his comments in a statement issued later in the day. “Our city denounces this and all acts of violence, and we are united in our grief over this devastating loss of life,” he said. Toronto Police Deputy Chief Peter Yuen said all available resources were deployed to the scene. He confirmed that there is no risk to the public, and the suspect is in custody. Two hotlines have been established, one for victims and their families, and the other for witnesses or others who may have information that could aid in an investigation. The investigation is being handled by the city police at this time, and not by the RCMP. “I ask the City of Toronto, pray for our victims,” Yuen said. Ontario Premier Kathleen Wynne said leaders from throughout the country called to offer their condolences and support. Prime Minister Justin Trudeau and Public Safety Minister Ralph Goodale issued statements and spoke to reporters. Goodale was in meetings Monday as a part of a G7 summit being held in Toronto this week. “Horrible day in Toronto,” Goodale, who is also the MP for Regina-Wascana, wrote in a tweet on Twitter. Saskatchewan Premier Scott Moe also expressed his condolences. “Devastating news coming out of Toronto,” he said on Twitter. Goodale spoke to reporters Monday evening. Goodale said all members of the G7 meeting he was in also passed along their condolences. He stressed that there does not appear to be a threat to national security at this time. Police Chief Mark Saunders said the actions looked deliberate, and police are not ruling out any motivation at this time. He said investigators will follow wherever the evidence takes them. Previous articleThey were there for us. Now it’s our turn to be there for them.